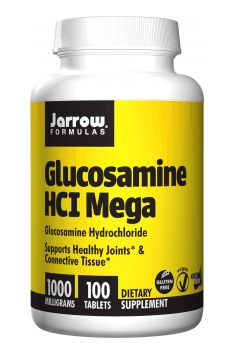 Glucosamine HCl Mega by Jarrow Formulas® is a dietary supplement containing a high dose of glucosamine. It is a molecule, which has positive influence on the health of joints, thanks to which it ensures proper work of the musculoskeletal system and protects it from degradation, which appears with age. Glucosamine is a molecule from the group of amino saccharides, which supports health of the musculoskeletal system. Intestinal absorption of this compound is not very efficient, but long-lasting supplementation enables obtaining its more effective concentration in the organism. The substance may constitute a substrate used during the synthesis of collagen, which is a basic connective tissue of the organism. Cartilages are incredibly important structures in joints. They ensure proper mobility and amortization during movement and protect joint surfaces. With age, their natural degradation takes place, which causes the development of degradations and inflammations of joints. The application of the active substances has an inhibiting influence on degradation of this structure. Moreover, glucosamine inhibits the development of excessive inflammations by inhibiting the molecule COX-2. It takes part in the synthesis of pro-inflammatory compounds, which is responsible for pain, swelling and degradation of tissues. Obtaining effective concentration of this amino saccharides in joints ensures analgesic and anti-inflammatory effect. The work of joints is facilitated thanks to the presence of synovial fluid. It constitutes natural lubricant, which protects from excessive attrition of joint surfaces. It is an important element which prevents degradation of joints. The supplement GlucosamineHCl Mega is a preparation, characterized by a high dose of glucosamine, which improves the state of joints and connective tissue in the organism. Additional supplementation with this compound is recommended to people who practice sports, which burden joints and to all people who deal with injuries. A special target group are elderly people. It results from the fact that with age degradation of cartilaginous tissue takes place in the organism. Glucosamine HCl Mega 1000mg 100 tab. Take 1 tablet 1 or 2 times per day or as directed by your qualified healthcare professional. Glucosamine is a substance, which is poorly absorbed. Therefore, long-lasting application of this substance is recommended (at least 4 months) in order to obtain its effective concentration in tissues. The effects related to the application of this amino acid are dependent on the dose. People with serious problems are recommended to apply even 3000-4000 mg of the active substance. However, a single dose should be divided into a few smaller portions to avoid unpleasant side-effects in the digestive system. It was proven that simultaneous application of chondroitin and MSM maximizes the activity of glucosamine. Cellulose, Stearic acid (vegetable source), Magnesium stearate (vegetable source), Silicon dioxide, Food grade coating. Contains no shrimp shell-derived glucosamine, no wheat, no gluten, no soybeans, no dairy, no egg, no Fish/shellfish, no peanuts/tree nuts.